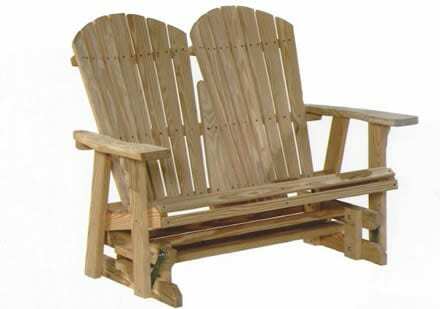 Liven up your porch, deck, patio, or poolside with comfortable, durable Amish outdoor furniture from Amish Originals. Our beautiful wood furniture can be made of treated pine for a weatherproof carefree finish, or it can be made of long-lasting, all-weather poly lumber in a variety of colors. What is Poly Lumber Furniture? Poly lumber outdoor furniture is made for year-round outdoor use. It is maintenance-free, high-end patio furniture that is created from high-density polyethylene (HDPE) plastic that has the look and feel of textured wood. It is water proof and cleans with just soap and water. It can be power washed. Poly Lumber does not hold water, rot, splinter, or attract insects. Poly lumber furniture is made out of thick, heavy wood-like lumber boards with wood construction techniques. A variety of colors are available. Remember to add a table to hold your drink, book, and sunglasses. Cup holders can be ordered for the arms of the poly lumber chairs. Plan to enjoy your summer in the sun (or the shade) with Amish outdoor furniture. Browse our website for more details on which pieces are available in weatherproofed pine, and which are in all-weather poly lumber. Get directions to our large showroom in Westerville, Ohio, and stop in to try out the furniture for yourself. Bring your truck along, because you will want to take it home with you! The comfort and fit of this beautiful furniture will win you over. Feel free to contact us with your questions. Our friendly staff would love to talk with you.